This series of notes is known as “Series C” and the designs are the output from a limited competition held in 1991 in which nine Irish artists were invited – the winner was Robert Ballagh. This series of notes had denominations of £5, £10, £20, £50 and £100 – with no pound note, since there a coin of this value circulating since 1990. The £20 was the first to be issued, following widespread forgery of the Series B (W.B. Yeats) £20 note. The theme for this series was people who contributed to the formation of a modern Ireland, and features politicians, a language, literary and religious figures. James Joyce’s final novel signed by James Joyce. How many “C Series” £10 notes were issued? Yes, that’s 3.1 billion punts ! 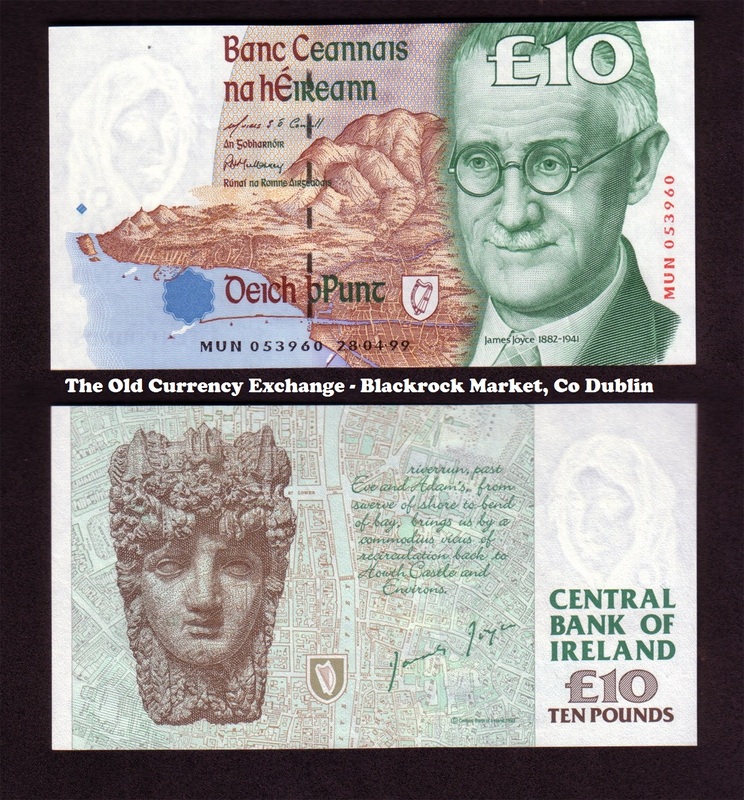 1999 C Series £10 Banknote – featuring James Augustine Aloysius Joyce (1882–1941) was an Irish novelist and poet, considered to be one of the most influential writers in the modernist avant-garde of the early 20th century. Joyce is best known for Ulysses (1922), a landmark work in which the episodes of Homer’s Odyssey are paralleled in an array of contrasting literary styles, perhaps most prominent among these the stream of consciousness technique he utilized. Other well-known works are the short-story collection Dubliners (1914), and the novels A Portrait of the Artist as a Young Man (1916) and Finnegans Wake (1939). His other writings include three books of poetry, a play, occasional journalism, and his published letters. Joyce was born in 41 Brighton Square, Rathgar, Dublin into a middle-class family on the way down. A brilliant student, he attended the Jesuit schools Clongowes and Belvedere but held a secret aversion to Catholicism which turned into open warfare (as he himself put it) in later life. Despite a chaotic family life caused by his father’s alcoholism and unpredictable finances, he went on to graduate from University College Dublin where he studied English, French and Italian. In 1904, in his early twenties he emigrated permanently to continental Europe with his partner Nora Barnacle. They lived in Trieste, Paris, and Zurich. Though most of his adult life was spent abroad, Joyce’s fictional universe centres on Dublin, and is populated largely by characters who closely resemble family members, enemies and friends from his time there; Ulysses in particular is set with precision in the streets and alleyways of the city. In 1891 Joyce wrote a poem on the death of Charles Stewart Parnell. His father was angry at the treatment of Parnell by the Catholic church, the Irish Home Rule Party and the English Liberal Party and the resulting collaborative failure to secure Home Rule for Ireland. The Irish Party had dropped Parnell from leadership. But the Vatican’s role in allying with the English Conservative Party to prevent Home Rule left a lasting impression on the young Joyce. Many of the friends he made at University College Dublin appeared as characters in Joyce’s works. His closest colleagues included leading figures of the generation, most notably, Thomas Kettle, Francis Sheehy-Skeffington and Oliver St. John Gogarty. Joyce was first introduced to the Irish public by Arthur Griffith in his newspaper, The United Irishman, in November 1901. Joyce had written an article on the Irish Literary Theatre and his college magazine refused to print it. Joyce had it printed and distributed locally. Griffith himself wrote a piece decrying the censorship of the student James Joyce. In 1904, he left Ireland with Nora to live on the Continent. Joyce’s Irish experiences constitute an essential element of his writings, and provide all of the settings for his fiction and much of its subject matter. His early volume of short stories, Dubliners, is a penetrating analysis of the stagnation and paralysis of Dublin society. The stories incorporate epiphanies, a word used particularly by Joyce, by which he meant a sudden consciousness of the “soul” of a thing. A Portrait of the Artist as a Young Man is a nearly complete re-write of the abandoned novel Stephen Hero. Joyce attempted to burn the original manuscript in a fit of rage during an argument with Nora, though to his subsequent relief it was rescued by his sister. A Künstlerroman, Portrait is a heavily autobiographical coming-of-age novel depicting the childhood and adolescence of protagonist Stephen Dedalus and his gradual growth into artistic self-consciousness. Some hints of the techniques Joyce frequently employed in later works, such as stream of consciousness, interior monologue, and references to a character’s psychic reality rather than to his external surroundings, are evident throughout this novel. With the appearance of both Ulysses and T. S. Eliot’s poem, The Waste Land, 1922 was a key year in the history of English-language literary modernism. In Ulysses, Joyce employs stream of consciousness, parody, jokes, and virtually every other established literary technique to present his characters. The action of the novel, which takes place in a single day, 16 June 1904, sets the characters and incidents of the Odyssey of Homer in modern Dublin and represents Odysseus (Ulysses), Penelope and Telemachus in the characters of Leopold Bloom, his wife Molly Bloom and Stephen Dedalus, parodically contrasted with their lofty models. Both Bloom and Dedalus represent Joyce in difference ages: youth and middle age. And both relate to each other symbolically in the novel as father and son. The key to this father/son relationship is revealed by Stephen on the Sandymount strand when he contemplates the Nicene Creed and the ‘consubstantial’ relationship of God the Father to Son. The book explores various areas of Dublin life, dwelling on its squalor and monotony. Nevertheless, the book is also an affectionately detailed study of the city, and Joyce claimed that if Dublin were to be destroyed in some catastrophe it could be rebuilt, brick by brick, using his work as a model. To achieve this level of accuracy, Joyce used the 1904 edition of Thom’s Directory—a work that listed the owners and/or tenants of every residential and commercial property in the city. He also bombarded friends still living there with requests for information and clarification. The book consists of 18 chapters, each covering roughly one hour of the day, beginning around 8 a.m. and ending sometime after 2 a.m. the following morning. Each chapter employs its own literary style, and parodies a specific episode in Homer’s Odyssey. Furthermore, each chapter is associated with a specific colour, art or science, and bodily organ. This combination of kaleidoscopic writing with an extreme formal schematic structure renders the book a major contribution to the development of 20th-century modernist literature. The use of classical mythology as an organising framework, the near-obsessive focus on external detail, and the occurrence of significant action within the minds of characters have also contributed to the development of literary modernism. Nevertheless, Joyce complained that, “I may have over-systematised Ulysses,” and played down the mythic correspondences by eliminating the chapter titles that had been taken from Homer. At his 57th birthday party at the Jolases’ home, Joyce revealed the final title of the work and Finnegan’s Wake was published in book form on 4 May 1939. Joyce’s method of stream of consciousness, literary allusions and free dream associations was pushed to the limit in Finnegan’s Wake, which abandoned all conventions of plot and character construction and is written in a peculiar and obscure language, based mainly on complex multi-level puns. This approach is similar to, but far more extensive than that used by Lewis Carroll in Jabberwocky. Much of the wordplay in the book stems from the use of multilingual puns which draw on a wide range of languages. The role played by Beckett and other assistants included collating words from these languages on cards for Joyce to use and, as Joyce’s eyesight worsened, of writing the text from the author’s dictation.